Mortlach is one of Diageo's workhorse distilleries that produces primarily for blends. However, unlike many of their Speyside distilleries, its output has far more character and tends to be used in small amounts to provide richness to thinner malts and grain whisky. This is due both to its exceptionally complex distillation process and the fact that it is one of the few remaining distilleries to use worm tub rather than shell in tube condensers, which reduces the amount of contact the spirit has with copper. These help to give Mortlach its distinctive 'meaty' character that is likely to do an increased concentration of sulphur compounds in the spirit. While I was in Lyon I stopped by The Whisky Lodge, which is an absolute delight of a shop (I had a great conversation about the oddities of American liquor sales with one of the employees). I was looking for a smaller bottle to drink while I was in France and one of the few they had in stock was a half bottle of G&M Mortlach 15 Year. Since I had been looking to try it for some time, this seemed like a perfect opportunity. While most of the bottle was drunk in about a week, I did manage to sneak a 2 oz sample home with me for further review. As with the licensed Linkwood 15 Year, this whisky was aged exclusively in refill sherry casks, then bottled at 43%, probably with chill filtration and possibly with coloring. Nose: a pleasant but not overwhelming sherry influence, berries, fresh grapes, melon, savory/meaty, dry and a little sharp sulphur, light oak, malt, fresh hay, blond tobacco, and mint in the background. After adding a few drops of water the notes become more integrated and some extra complexity comes out in the form of vanilla, more tropical and green (apple/pear) fruits, plus a hint of smoke and allspice. Taste: bittersweet throughout, sherry and malt richness beginning at the front, some minty/floral top notes and tobacco in the middle, which is made less sweet by rising oak tannins, black pepper, and sulphur near the back. After dilution it becomes softer and sweeter, the sulphur integrates into the sherry, some vanilla joins the oak, and the oak tannins only come out right at the back. While this is not the first Mortlach I've ever tried (I got to sample the G&M 21 Year several years ago), this is the first 'classic' Mortlach I've tried. It hits all of the notes I expected, from the savory character of the sherry to the rather present sulfurous notes. So my willingness to recommend this whisky rests almost entirely on your tolerance for sulphur - if it's something you are OK with or enjoy, this will probably tickle your fancy. If you can't stand even a little bit of struck match, then I would give this a wide berth. Out of the blend-oriented Speyside distilleries, Linkwood has to be one of my favorites, though I will admit that it doesn't have a firm empirical basis as it comes to me partially by extrapolation. Whisky drinkers are most likely to encounter it as a component of the nerd favorite Johnnie Walker Green Label blended malt, a comparatively bright star among the dullness of the rest of the JW lineup. I've also quite enjoyed the single cask from Signatory that I tried, which had a lot of the character I enjoyed from JW Green without the associated Diageo muddiness. So I was interested to see how the spirit would fare when subjected to more active sherry casks rather than more neutral refill bourbon casks. This whisky is aged for a minimum of fifteen years in refill sherry casks then bottled at 43% with chill filtration and possibly with added color. This was sampled at the Wallace Bar in Lyon. Nose: richly sherried, more sweet than savory, raisins, a slightly burnt edge, creamy, lightly perfumed/floral. After adding a few drops of water it is largely unchanged except for a bit of funk that comes out. Taste: sherry-driven and moderately sweet with a floral background throughout, fades into creamy malt near the back. After dilution the sherry becomes brighter up front, but the fade into the finish is more bittersweet. First, some caveats. I tried this whisky at a fairly noisy, crowded bar and the pour was from the bottom of the bottle, so I'm not particularly confident that it was showing its best side. With that said, I found it fairly boring. Its extremely generic with little to make any Linkwood character clear. The sherry casks are the star of the show and while they are technically flawless, there are no flourishes either. So while it's a perfectly competent sherried malt that would make for an easy-drinking whisky when you don't want anything challenging, it's also not something that I will go out of my way to buy. Amrut was the first distillery in India to produce single malt whisky. When distillery began making malt whisky in the 1980s it was used exclusively for producing blended whiskies. It was not until 2004 that they launched a single malt whisky, targeting a profile similar to that of Scottish malt whisky. Since then they have released a panoply of different whiskies using both local unpeated malt and imported peated malt as well as an extraordinary variety of cask types. 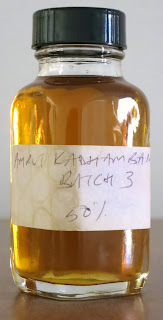 Much like Bruichladdich in the early to mid-2000s or, more recently, Kavalan, it's somewhat unclear whether the popularity of Amrut is primarily driven by quality or novelty, both from the rarity of Indian single malt and the creativity of their production methods. This whisky was distilled from 90% local unpeated malt and 10% imported peated malt, then aged in ex-sherry butts, followed by ex-brandy casks, then finally ex-rum casks and bottled at 50% without coloring or chill filtration. Thanks to MAO for the sample. Nose: maple syrup/molasses/rum, oatmeal, malt, grape brandy, baked apples, orange peel, sherry, spicy oak in the background, a thread of wood smoke, a little herbal. After adding a few drops of water the rum and brandy come to the fore, some berry notes come out. Taste: sweet oak up front, becoming more tannic towards the back, picking up some of the various cask notes on top from the middle - but everything is kind of indistinct/muddled - and herbal notes peek out at the back. After dilution the elements integrate and flatten - the oak is less sharp and bitter, letting the cask influences shine a bit more, and a touch of peat comes out at the end. 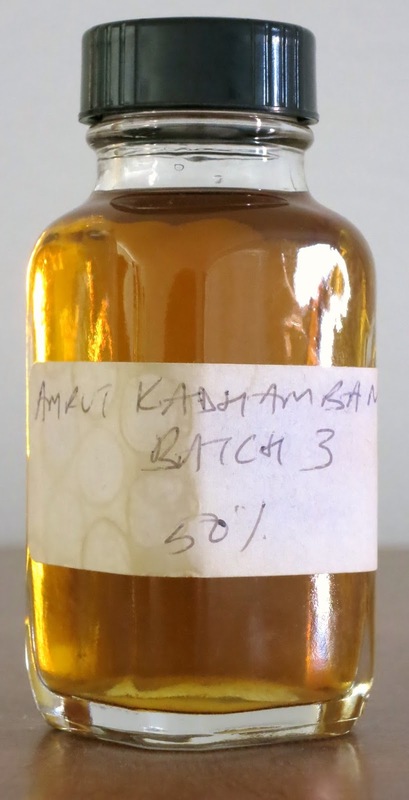 I feel like Amrut's most significant accomplishment is to have produced a relatively young malt without any of the green notes that I expect from younger whiskies. At the same time, there's a lack of integration that seems spot-on for younger malts - the casks have each left their mark, but haven't had enough time to develop into something more. All of that comes with the caveat that I'm tasting from a sample that may have degraded, but given the price these releases command, I don't think they're something I would spend my own money on. Sometimes classic drinks almost hit the mark, but miss by an inch. That's how the Automobile Cocktail was for me. 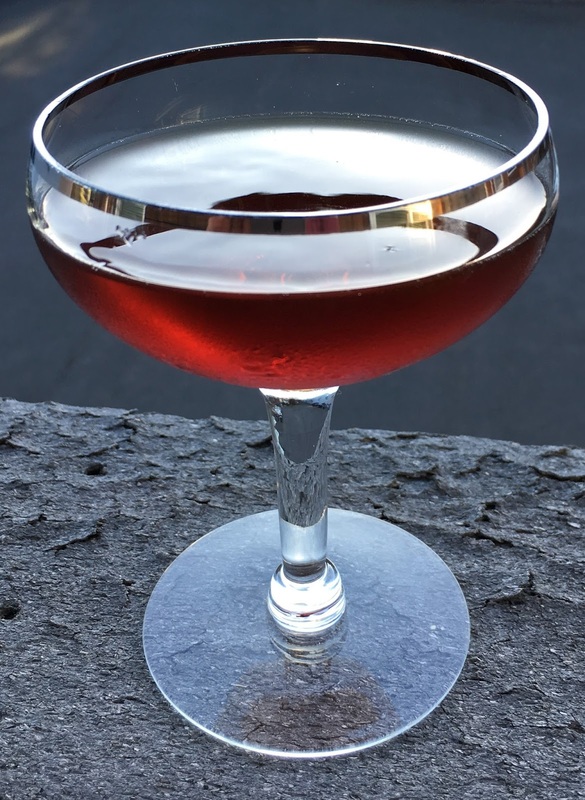 The combination of scotch, gin, vermouth, and bitters looked like an unlikely combo on paper, but I was willing to give it a go. While it almost worked, the various elements never quite seemed to come together. But thinking about what worked and what didn't made me wonder if I could tweak it into something more agreeable. Giving it a little French twist did the trick. Combine all ingredients, stir with ice for fifteen seconds, then strain into a chilled cocktail glass. The nose is fairly subdued, but some grape from the cognac and brighter orange notes from the Bigallet peek out, with hints of bitterness from the gin and amer. The sip opens with moderate grape sweetness, sliding through bittersweet in the middle and bitter at the back as the gin and amer team up. The finish is long and lingering with juniper and spices. The first edition of Laddie Ten was met with a significant amount of fanfare, representing the distillery coming into its own. Its loss was equally significant, demonstrating that not all was right in their warehouses. When Bruichladdich announced a second edition of Laddie Ten, it was met with significant excitement, albeit tempered by the knowledge that it was explicitly labeled as a limited edition, as opposed to an ongoing release. This whisky was constructed from ex-bourbon, ex-sherry, and ex-red wine casks, then bottled at 50% without coloring or chill filtration. Nose: fairly lean overall, a healthy dose of European oak, caramel, dusty red wine and sherry, plum, malt, herbal, baking spices. After adding a few drops of water the wine and fruit notes become jammier and more sherried, the malt and oak are more balanced, and the herbal notes become more peaty/new make-y. Taste: red wine and berries with a malty, caramel thickness throughout, increasingly tannic at the back with underlying notes of peat and chocolate. After dilution it becomes more balanced, with the wine and malt notes complementing each other and the oak integrating into both. The red wine component of this vatting really shows through. While less disjointed than some other Laddies with a similar treatment, it does seem a shame to cover up the spirit with a coating of wine. With that said, Bruichladdich seems to have ironed out whatever problems it had with its spirit back when the first Laddie Ten was released. On the other hand, this one seems to benefit from water in the same way as the Laddie Eight, so it's unclear to me why these were bottled at 50% instead of 46%. Hopefully we'll see less tinkered with Laddies in the future, because this has promise even if it's not my jam in its current form. The period after Bruichladdich was taken over by Rémy Cointreau saw the disappearance of nearly all of their age-dated single malts, ostensibly because aged stocks had been run down by the previous lineup of 10, 16, and 22 Year olds released near the end of the Reynier era. The (almost) all-NAS lineup that replaced it allowed them to use younger whiskies while they rebuilt. Within the last year we have started to see hints that this hiatus may be coming to a close. Within that period they have released a number of age dated single malts, albeit ones with single-digit or low double-digit ages. This almost feels like an attempt to bring some closure to the missteps that were made just before and during the takeover, suggesting that they are entering a new era of stability. But the important question is whether the whisky is any good. This whisky was aged in a mix of European (presumably sherry or some other kind of wine casks) and American (presumably bourbon and sherry casks) oak, then bottled at 50% without coloring or chill filtration. Nose: fresh malt, new make, a touch of sherry/vinegar/sour red wine, berries, herbal, vanilla, cinnamon, a little coastal and nutty, lightly charred oak. After adding a few drops of water the sherry is amplified alongside the sour notes and more European oak comes out, but the new make mostly fades. Taste: creamy malt throughout, a touch of sherry, sour wine, berries, and lemon peel in the middle, increasingly strong/bitter oak with some herbal notes and sherried roundness at the back. After dilution it becomes more herbal, the oak at the back gains more European character and is balanced with a bit of peat, while the sherry/sour notes in the middle become stronger but more integrated. Contrary to much of the younger releases during the Reynier era of Bruichladdich, this one appears to have had some moderately aggressive casks in the mix. While this is closer to the first 10 Year made from pre-purchase stocks that I liked, it still feels underdone - while the spirit is cleaner and lacking in the unpleasant funk that I found in the Laddie Ten First Edition, the oak has added too much and become overly tannic at full strength. Some of that can be mitigated with dilution, which makes me think that this would have been better off at their standard 46%. This gives me some hope for the future of Bruichladdich when they have a more stable balance between production and sales, but I'll give a full bottle a miss right now. For whatever reason, a lot of Clynelish from 1997 has made its way into the hands of independent bottlers over the last ten years, most of it from ex-bourbon casks. These provide an interesting glimpse into the range of flavors from this distillery, in comparison to the slightly muddy OB 14 Year. This whisky was distilled in 1997, filled in what was almost certainly a refill bourbon hogshead, then bottled in 2010 at 45% without coloring or chill filtration. Thanks to Michael Kravitz for the sample. Nose: malty, some wood spices, a little musty vanilla, orange peel, banana. After adding a few drops of water it becomes simpler, but picks up a little waxiness and feels more traditionally Clynelish. Taste: sweet malt up front, undertones of new make spirit and caramel thickness throughout, strong apple notes in the middle, a few tannic prickles near the back. After dilution it becomes sweeter throughout and the apples become raisins, but what oak there is becomes cardboard-y and it also picks up some citrus-y sourness and a little bit of wax. This is a very naked Clynelish. I thought that was the case in the BBR Clynelish I tried several years ago, but this is even more so. While the new make character isn't oppressive, it is clear that the casks weren't active enough to smooth off those rough edges after a dozen years. Ultimately I don't think this is significantly better than the OB 14 Year, despite that one's flaws. There's just not enough going on around the youthfulness to make it really engaging except as an academic exercise.